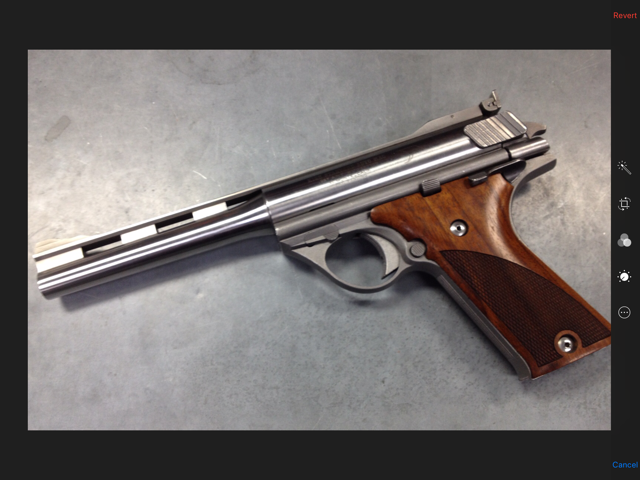 Quote Reply Topic: What kind of grips are these? 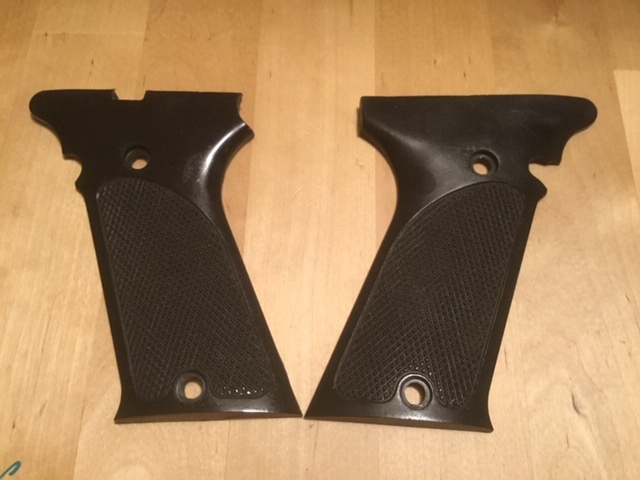 I got a stash of Auto Mag stuff including a pair of original-looking grips. The thing is, I know there were several different versions of the North Hollywood/El Monte/High Standard/etc. grips, but I haven’t the slightest idea which is what. And Triple K makes reproduction grips too. So can anybody tell me what these are? Nobody cares to hazard a guess? I know that they differ in detail depending on what process was used to make them originally, and people can tell based on the presence and location of various dimples and marks on the back. Unfortunately I lack the requisite knowledge. FWIW they came off of a High Standard gun. Could they be original to that gun? They look like they could be stock for a high standard. Remember only the early Pasadenas were all checkered, everything else looked like yours. The only reason to replace the originals for another set of plastics is if the originals cracked, which many did. But most people go with a more appealing replacement, so I would say they are probably stock, but no real way of knowing for sure! Just enjoy!! I know that I might be corrected very quickly, but from what I have noticed is that the North Hollywood's tend to be more dull. Especially if untouched. Now, if someone has "cleaned up" their NH and wiped the grips down with something, then they will be more shiny like I've noticed on the El Monte's and the others. I don't know if it is just the lighting but the two grips appear different. One appears to be more shiny than the other. I too am wanting to learn the differences and how to tell them apart. I'll be paying attention to this thread. So.... what else did you get? The Pasadena grips were fully-checkered hand poured polyurethane grips. The TDE North Hollywood grips were a partially checkered hand poured polyurethane grips. The TDE El Monte grips were partially checkered injection molded grips made out of model plastic that break after the first shot. The TDE El Monte High Standard guns used the TDE North Hollywood grips that won't break. I complimented Don Mitchell about his use of the unbreakable grips on the guns he ordered. He was the CEO of High Standard at the time. 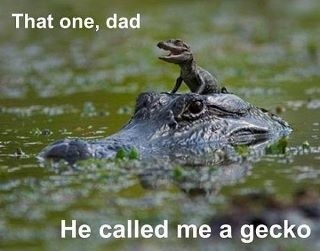 Mr. Mitchell said, "I held Harry to a higher standard." 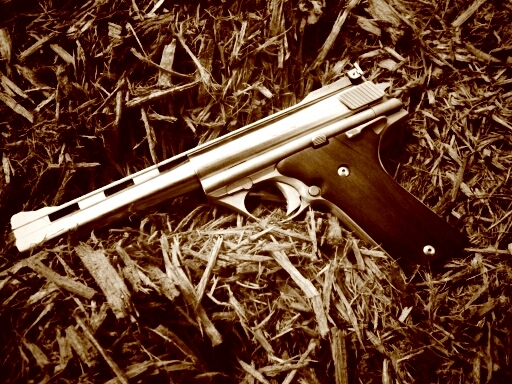 Later guns, like the "B" models, used partially checkered, injection molded grips that were made of an unbreakable plastic that has a fiber content. Technically Bob Barbasiewicz's home was at 9503 East Guess Street is in Rosemead Calif., just over the City of El Monte's border. The North Hollywood "Vanowen" address is a shop complex where you could rent a space. B & B Sales kept the Auto Mag accessories there and shipped from this location. In the picture of the right grip, inside panel, it appears there are "spots" towards the top. Would this be indicative of air bubbles? Would that be an indication that it was hand poured or injected? I know it's not the clearest picture but it also seems as if there are "fibers" that are faint on the flat portion of the right grip? Those are not "Regular" El Monte grips, the backside is more hollowed out. and it's hard plastic. I didn't realize that about the High Standard guns, but that's nice to know. Triple K bought Vintage Gun Grips in Florida. 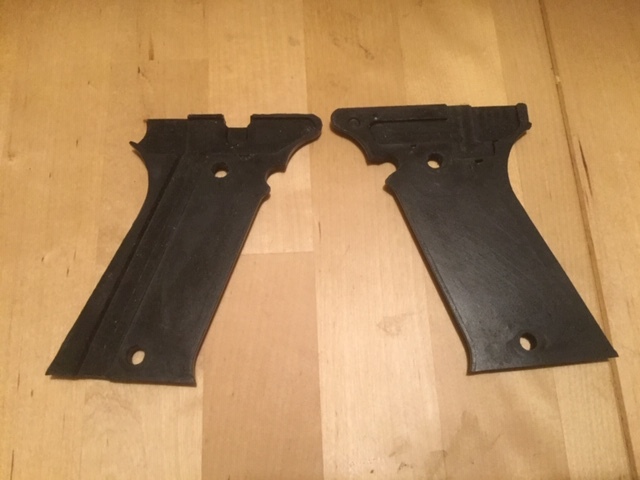 I know Vintage Gun Grips here revised their mold at least once as someone here sent a set of unbroken grips for them to copy, as the old mold I think was made from a reglued broken grip or it wasn't the best. Of course Bruce made the best reproductions! Thanks for the great info, and you’re right, the photos are absolutely terrible. I took them at night with artificial lighting. This weekend I will shoot some photos in the daylight and maybe we can get a more definitive identification. ...and an absolutely beautiful High Standard 357 Auto Mag Model 160 with 6.5-inch vent rib barrel. Nice grips there, but a bit pricey, no? Considering they are cut and shaped by machine in minutes.